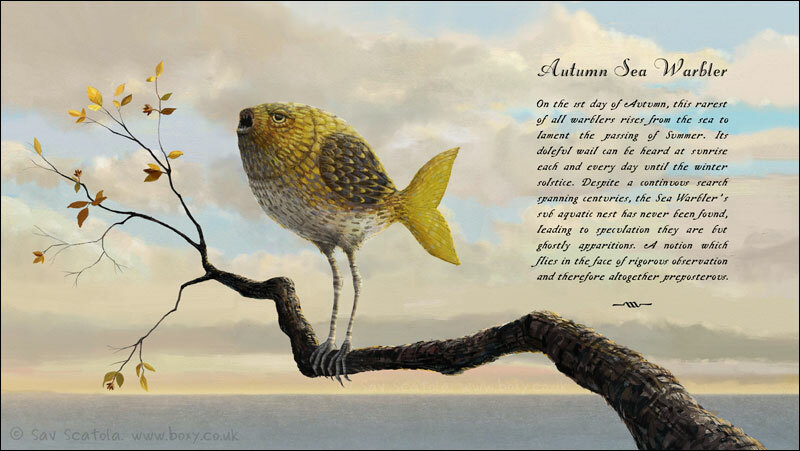 I seem to have got into the habit of celebrating each Autumn with a painting. This year things went inexplicably surreal. Don't even ask, I have no idea. Although I quite like the idea of presenting mythical creatures in this way. Next up, medieval dogheads! Happy Autumn, thanks for looking. Good'n Boxy! Looks like a mean little critter. Like a flying fish with fangs. Very well done! This critter is a fantastic creation of Your fantasy and I absolutely love the style, credibility and the atmospheres of your reduced-chroma imaginary world. Love it. Very fun vision very well realized. Thanks for the kind words Caesar and DAkey! I love it! Looks like a puffer fish mated with a canary. Great work. Thanks! I love that description.